*A version of this article was first published on Montessori Tides School website. We thought we were just playing. We didn’t know that we were wiring neural pathways in our brain that would make learning easier. We know now that movement strengthens learning. This is supported by a groundswell of research in neuroscience, showing the powerful connection between movement and cognition. Appropriate developmental movement sets the stage for academic learning, and without the establishment of certain sensory-motor skills (ie..skipping, balancing on one foot), a child’s readiness for reading, writing and math can be hindered. I have been volunteering at Montessori Tides School bringing specific rhythm and movement activities to the lower elementary students. 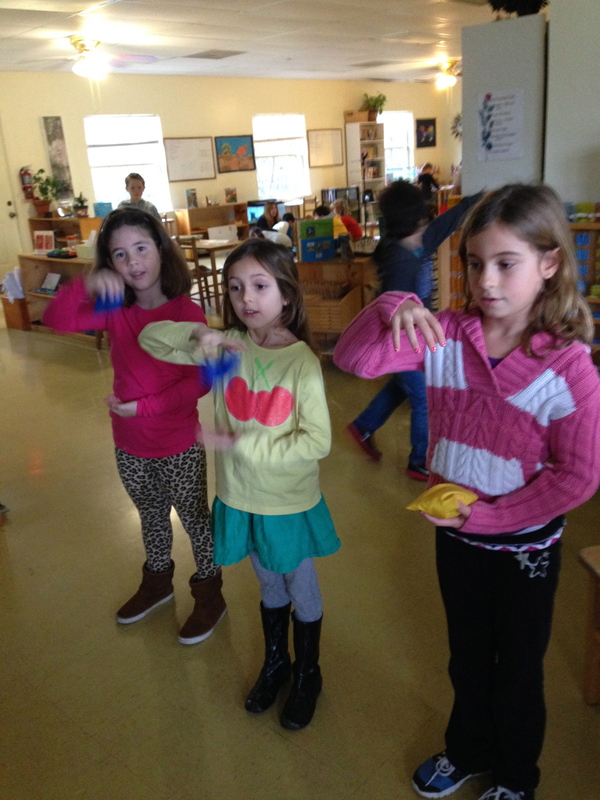 We’ve learned hand-clap games, beanbag games, and lots of singing games that are healthy, enjoyable ways to strengthen capacities for success in reading, writing and math (such as visual and auditory perception, spatial orientation, concentration, rhythm and rhyme, sensory and midline integration). Equally important, singing and moving together builds community and spreads joy, and gives us all an experience of being in our physical bodies. Some old favorites from my own childhood, like “Go all the way ‘round zero…” have been a hit with the students. When my daughter told me they played this circle game on their own at recess, I was thrilled. Thrilled! This meant that someone exercised self-initiative to get the group and game going; it meant everyone involved had to come into relationship with each other, and make something happen that could only be done in a group working together; it meant they created a feeling of togetherness, respect and camaraderie. As if sharpening their social skills didn’t thrill me enough, they were also becoming better readers on the playground. The skills they were calling upon- memorization, concentration, sensitivity to sounds, rhyme and rhythm- are skills needed for reading. They think they are just playing. And they are, of course! This play supports their learning…AND this play is vital in and of itself for the sheer joy of it, and for the unhindered ability to just be children, doing what children naturally love to do. If your child is having difficulty sitting still in school or difficulties learning, I encourage you to look at how developmental movement can help. Check out Dr. Susan R. Johnson’s educational articles, the above websites for more on neurodevelopment movement programs, and how consulting with programs such as Balance in Childhood can help. Building blocks–exactly Donna! So often, what the children are doing (their movement, their play, etc) is exactly what is needed to hold the next thing. Excellent information for parents to know – soon everyone will know that PLAY is a wonderful place of learning. A breath of fresh air – thanks for getting the word out!